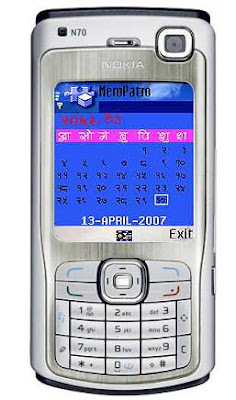 Mero Patro is a mobile software which shows Nepalese Calendar on mobile phone. This program works on any mobile phone which supports JAVA MIDP. If a phone can execute '.jar' type of files then it surely will work. I had written something about Mero Patro on my previous Post but somehow it seemed lost in the middle of it and i thought it deserves separate post for it's description. So, anyone if would like to check dates on Nepalese calendar on their mobile devices,then this little software by Anup Shrestha would come very handy. Thanks to Mr. Anup since i'm using it on my N70 too. It's very nice little software of 10kb. I wish author would put major Nepalese Holidays bookmark on it, ability to put schedule notes or something like that but i see, it would need lots of work and may be better off with some price tag on it, if so. :) Anyway, it's still a very nice handy tool for everyone.